You know what? I want to propose that either officially or unofficially it becomes a rule to add a “Read More” link to the UESP blog posts after an introductory couple of paragraphs. The blog is so much more manageable to browse when the posts are condensed and the page isn't overrun with information and text, yes? Then why am I the only one who has started doing this?!? At long last they’ve finally given us some solid info on ES:Legends! Earlier this week, they updated their website, released a gameplay video, and launched the closed beta. They’re also at PAX East this weekend, and had a short segment on PAX’s stream discussing and showing the game. So since I’m excited for it, I’ve decided to summarize what we know so far, and share my thoughts. No, it’s not slowing down ES6; this game is by a completely different studio, Dire Wolf Digital, not Bethesda Game Studios, so it has nothing to do with the development of the main series. And ES6 isn’t really “late”, either, based on the pattern of their last few releases: 2.5 years between Oblivion and Fallout 3, 3 years between Fallout 3 and Skyrim, and 4 years between Skyrim and Fallout 4. (If you’re wondering why I didn’t mention New Vegas, that was by a different studio, like ESO, Dishonored, and this card game.) My personal estimate for ES6, therefore, is 2019-2020. Lots of accusations about only being made because of Hearthstone. They didn’t decide to make this game just because of Hearthstone’s success; it’s been in the works since before Hearthstone went to beta. I certainly imagine it might have influenced some of its aspects, but considering that Dire Wolf’s staff includes professional-level Magic: the Gathering players, it’s likely that there’s plenty of inspiration from Magic as well. That’s what the battlefield looks like. The field is divided into two halves, called “lanes”. If you play a creature in one of the lanes, it can only attack other creatures within that lane, or the other player. The lanes may have “conditions”: the standard setup is that the left lane has no conditions, while the right lane is a “shadow” lane, meaning that your card cannot be attacked by the other player’s creatures until after your next turn. 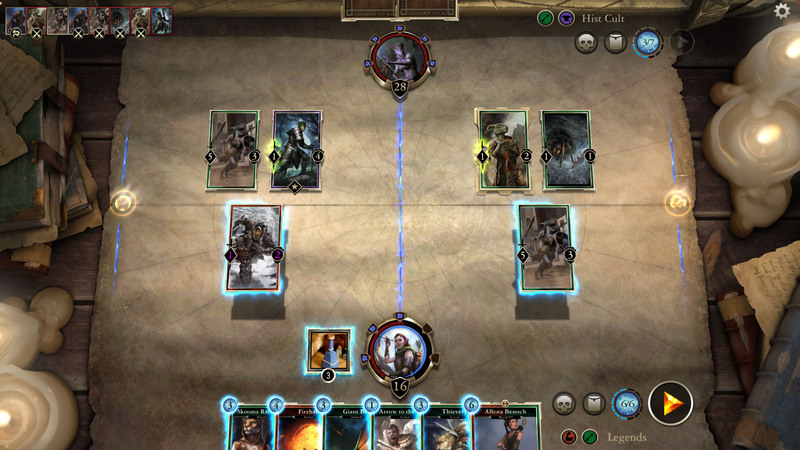 Every time you lose 5 health, you lose one of the blue “runes” around your avatar, and draw the top card on your deck. If it says “Prophecy” on it, you can play it immediately for free, during the other player’s turn, and shake things up a bit. Each card is based on one or two of five “attributes” (Strength, Intelligence, Willpower, Agility, or Endurance), and decks are built around classes that consist of two of these attributes. As far as your avatar/race, rather than choosing a hero with a hero power, your avatar simply influences which types of cards you earn more quickly. There’ll be a couple types of gameplay: story mode (which is sort of like a tutorial), single battles against the AI and other players, and “Arena” matches, in which you choose a class and are given cards to put together a deck on the fly to last you through a number of consecutive matches (also against either other players or the AI). The game will be free-to-play, and card packs and arena tickets will be available for purchase, although they also can be earned through normal gameplay as well. That’s about all I can think of so far, except that there have been around 200 cards revealed so far between the gameplay video, official articles, and other promotional material. Someone's put together an album with most of the ones we've seen so far, if you're interested in looking at them before we get card pages up and running on the wiki. And if you want a bit more detail on some of the game mechanics that hasn't been mentioned by an "official" source yet, but was reported by a fan who went to the PAX East booth, check out this thread on the subreddit. If you'd like to discuss the game, feel free to do so in our Legends subforum! Now that we’ve actually seen what the game and gameplay look like, I think my “cautious optimism” after the announcement trailer was both justified and rewarded, and I’m really looking forward to it. Scratch that, I’m extremely enthusiastic about it at the moment. I enjoy Magic: the Gathering (admittedly I’m not great at it, but I have fun nonetheless), and I’ve played a bit of some digital card games as well (a bit of Hearthstone, a lot of Rage of Bahamut, and the closed beta of Shadowverse). Strategy card game plus Elder Scrolls art/lore? Heck yes. From what we’ve seen so far, this looks like it’ll have some interesting strategy, especially with the whole "lane" thing. And of course the art, I’ll admit, is one of the things I’m most excited about. The original teaser trailer didn’t even scratch the surface: it’s absolutely gorgeous, and I always love seeing the Elder Scrolls world brought to life in this way. So, all in all, I’m pleased with what we’ve seen of it so far, and I can’t wait until it comes out! I figured this would be something to make, since it's a TES-related post and I never write them. After not hearing about it for so long that I forgot it was a thing, that bizarre online card game called Legends has been publicly announced to be in a closed beta, with additional information and demos coming at the gaming conferences this year. It's not a full-blown Elder Scrolls single player game, nor is it the multiplayer ESO, but after years of not having an interesting TES release, any TES release is a good release. 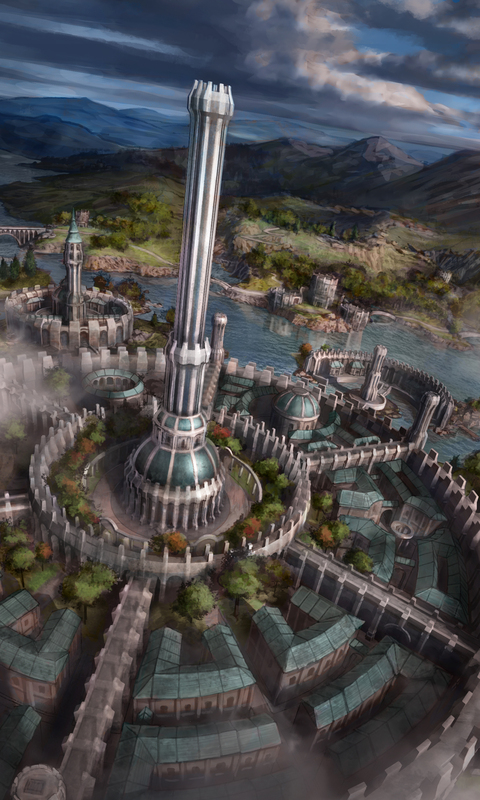 Not that I am knocking on the premise of the game or on ESO, of course. I've never been interested in such card games in the past, and I almost (almost!) want to dislike the game based on that alone, but being the loyal fanboy that I am, I've decided I'd sign up for the beta and give it a trial run. There isn't a monstrous load of information out at present, but information is coming out, and you can sign up for the closed beta at bethesda.net. The beta is under a non-disclosure agreement, so if you sign up, you are not permitted to disclose details about the beta. Now, I just need to remember to check my emails. I check my emails so infrequently that, back during the NDA'd ESO beta I had actually been invited into the beta several times, but I didn't realise it until the game was given the full release and cost money! Speaking of ESO... I haven't played it yet. I spent the money, bought the discs at the store, and I've not yet installed it. I really want to give it a run at some point, but the install will be so big, and I'm always overwhelmed by how much stuff there is and the fact that people are running around in my bubble and existing... Which isn't a knock on ESO specifically, but on MMOs in general. This blog post would probably be out of the norm for the Unofficial Elder Scrolls Pages blog, because this is about soccer games, not fantasy RPGs. However, this blog post is not completely out of the line, as far as I'd think blog posts go. Sure, it's not about a Bethesda game or a game review, but it does offer forward insight into the roleplaying aspect of a game, I'd say. Why am I making a blog post about Football Manager, then? How many gamer geeks like me who can tell more about Tamrielic history than our world's care about a niche soccer game where you look at spreadsheets and budgets? Probably not a lot, but humor me and stick around to the end, because I want to challenge the notion that there are some games that don't offer forward any value as far as story telling and emotionally driven narration go. With the right creative mindset, anything can tell a story if you want it to and slow down to truly enjoy the experience.